It is in our long-term interest to foster healthy and vibrant communities. Respecting and supporting communities where our employees and business associates live and work is an important part of our being a trusted partner in the local communities where we operate. The Festival of the Performing Arts Limited is an annual event to support and enable youth to develop appreciation for music, dance and theater. The outreach is aimed at inspiring children to participate in artistic pursuits and learn from experienced, world-renowned artists. The festival is made possible through corporate and individual donors. In fiscal 2014, Bacardi made a cash donation of US $45,660 to support the festival, and it was a great success. The festival 2013 season featured 24 performances, engaging 11 groups of artists who participated in 11 outreach programs involving 1,500 Bermuda students invited from all of the local schools. For the first time, the festival also presented 11 “Freebie” daytime events in the Bermuda Society of Arts space, to compliment the “Festival Impressions” exhibit. These were well attended and gave several student musicians an opportunity to perform before a real audience. In total, there were 46 events during the six-week festival. The festival seeks out performers committed to outreach. The opportunity for young students to meet and participate with world-class artists is a wonderful experience and is enthusiastically supported by teachers in most of the participating schools. The Bermuda National Trust (‘the Trust’) maintains and preserves 70 properties, covering 250 acres and representing a rich variety of traditional historic homes, islands, gardens, cemeteries, nature reserves and coastline. In addition, three museums display an outstanding collection of artifacts owned and made by Bermudians, revealing the intriguing story of the island’s development. Bacardi has been a continuous supporter of the Bermuda National Trust Architectural Heritage Series since 2007. In fiscal 2014 Bacardi donated US $10,000 for the publication of the series. The Trust has a strong education program, focused on appreciation of the history of Bermuda and what that means to the country’s future. The Trust is also a leading advocate and activist for Bermuda’s natural environment. One initiative run by the Trust is the publication of an architectural series of books that chronicle Bermuda’s architectural heritage for future generations. Bacardi has been the title sponsor of the Bermuda National Trust Architectural Heritage series project for nearly 20 years, providing the Trust with the resources to produce this valuable book series. This book series is by far the most successful of all the Trust’s publications and is used throughout Bermuda by residents and visitors alike. As educational tools, the books are present in Bermuda’s schools, libraries and countless homes around the island. The series’ research team has compiled extensive local information, enabling publication of separate volumes for each of the 9 parishes of Bermuda. An upcoming publication, on the parish of Pembroke, features the iconic Bacardi world headquarters building. The historic city of Turin has been home and witness to many European art movements. Starting in the 16th and 17th centuries, the city took on its own unique characteristics with Baroque-style buildings and continued to be a center for preservation and study of the arts in the 1800s with the establishment of the Museum of Ancient At and founding of the first Fine Arts Supporter Society in Italy. Throughout this past fiscal year, Bacardi helped to preserve the historical, artistic heritage of the town of Turin through quarter-annual installments totaling almost US $150,000. The purpose of funding of the preservation of Turin is to preserve the artistic assets of the town that otherwise could not be restored by the local council due to a lack of funds. Bacardi made a cash donation of US $25,000 and a product donation of US $5,000 to support the Grand Gala fundraiser benefiting the Puerto Rican Museum of Arts. The funds from the Gala support a range of in-house academic programs geared for all ages as well as the resident artists. The donations go towards a scholarship fund for continuing education. The event reached over 3,000 people and over 700 artists have benefited from the Museum’s educational initiatives. BOMBAY SAPPHIRE donated over US $100,000 dollars to host a fundraiser with Rush Philanthropic Arts Foundation (RPAF) to raise money for RPAF programming aimed at providing underrepresented artists with significant exposure and access to the arts. RPAF’s two main programs consist of: Rush Education (art programs for youths) and Rush Art Galleries (which support and feature artists across the nation, helping to bring the arts to populations with limited access to the arts). The fundraiser was a pre-event cocktail engagement to raise dollars for RPAF programming. For 90 minutes, guests spent precious moments with the founder of RPAF, Russell Simmons, and a featured celebrity chef. Other high-profile attendees included Paris Hilton, Nicky Hilton, China Chow, Tommy Hilfiger, Lizzy Somerby, DJ Cassidy, Stephen Dorff, Shepard Fairey, Kelly BEnsimon, Angela Simmons and Ulf Ekberg. Bacardi is a founding member of Coral Gables Art Cinema. By bringing fine-arts films, foreign cinema and rarely seen masterpieces to the community, the Coral Gables Art Cinema provides crucial outreach and educational opportunities. In fiscal 2014, the cinema received a Knight Arts Challenge Grant to support a Children’s Film Festival. This sold-out event was filled with families and children participating in the arts. Bacardi supported the Coral Gables Art Cinema this year through a donation of US $10,000. The Cinema project was launched in 2006 as a partnership between the City of Coral Gables and the Coral Gables Cinemateque, Inc., a non-profit film arts organization, in collaboration with Magna-Tech Electronic Company. The City and the Coral Gables Community Foundation’s Perrin Fund, provided for the build-out expenses of the theater. Many major in-kind contributions of theater equipment and technology were provided to film industry companies. Individual donors such as Bacardi, made the state-of- the-art theater a reality – and it opened in October of 2010. It is one of the best, most comfortable and highest grossing art houses in South Florida, presenting first-run and regional premieres of quality American independent and international films. The theater features both fiction and documentary, in addition to classic films, special programs and film-festival events, reflecting the multilingual and multicultural diversity of the region. Since 2006, Bacardi has supported the Association of Bermuda International Companies (ABIC) Education Awards Scholarship, a program that provides financial assistance to Bermudian students pursuing higher education degrees (full undergraduate or post graduate). It focuses primarily on areas related to international business. Top students are selected based on financial need, academic ability and course of study. Each year, between 18 and 25 students receive awards valued at US $30,000 for two years. Awards are presented at a luncheon attended by the winning students and their parents, sponsor companies and government ministers. Since the program’s inception, more than 500 students have been awarded two-to-four-year scholarships. Students have attended accredited colleges and universities in Canada, the United States, the United Kingdom, Ireland, Continental Europe and Australia. Most recipients return to Bermuda, holding top-level positions in the international business industry, strengthening Bermuda’s economy and giving back to the community. ABIC has been in existence for 34 years and is the most comprehensive college scholarship program for Bermudian students. Over the past 10 years, international businesses in Bermuda have donated more than US $4 million to the ABICEA scholarship program. Some 50 companies contribute to the program each year. Through the ongoing and generous support of its members, ABIC will continue to help secure Bermuda’s future by investing in education. In fiscal 2014, Bacardi continued its long-time support to the scholarship fund by donating over US $18,000. Five students are supported each year with a scholarship fund provided for each student per month. This program assists with funding of nearly US $20,000 a year in furthering the education of graduates of the Pechora Orphan home. Bacardi employees did a blitz in bars and restaurants, warning about drinking and driving. The employees would split up into groups and distribute pamphlets with key messages, including: find the nearest taxi, elect a friend to drive and drink responsibly. More than 1,500 people were reached in more than 50 bars. 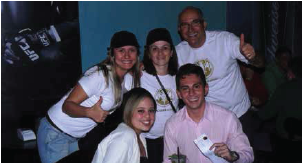 Almost 30 percent of the Bacardi employees in Brazil participated. Client and consumers received the employees well and realized the importance of the action. 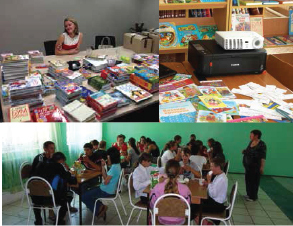 Bacardi employees in Russia gathered books throughout May 2013, to be sent to an orphanage in Ryazan. 1,000 books were collected from fairy tales for the little ones, to fiction and non-fiction literature for high-school students. All Bacardi participants wrote personal greetings on 130 bookmarks so that each child at the school would receive one. The goal of Bacardi was to upgrade the education of the children at the orphanage. The aim was to motivate the children to want to read and learn more while educating employees on the importance of supporting community orphanages. On June 4th, a group of Bacardi employees attended the library opening ceremony and communicated with the kids, participating in an outdoor activity and a small tea party. The Institute is a world-class academic center located at the University of Miami geared toward academic and outreach programs as well as organizing seminars, lectures, and publication of research regarding the culture of Cubans and Cuban-Americans. ICCAS offers special programs on Cuba for U.S. and foreign students and forms an educational link between the University, the Cuban exile community and the South Florida community at large. The Bacardi donation directly affects the education the University of Miami provides to the ICCAS students, enhancing quality and accessibility. Donations contribute to scholarships, foster faculty research and activities, build new facilities, improve information resources and fund academic and athletic programs. The organization was inspired by an “average Australian bloke,” in response to his shock while sailing through the world’s oceans, seeing vast amounts of pollution and garbage along the way. In 1989, a clean-up day was held in Sydney harbor, with over 40,000 participants. In 1990, the first offical “Clean Up Australia Day” was held and approximately 300,000 volunteers showed up. Since then, participation has steadily increased. Over the past 20 years, Australians have devoted more than 24-million hours supporting a clean local environment through “Clean Up Australia Day” and have collected more than 200,000 tons of garbage. Our Australian team supported six local communities to remove garbage from the local parks, recreation areas and sporting grounds. All 110 employees of Bacardi in Australia participated in this activity. The team collected over 150 kilograms of garbage from multiple sites around Australia. This particular activity was chosen by our Australian team, not only for the benefit of the environment but also for the honor of providing personal time and effort to this important Australian-founded cause. The Atlantic Conservation Partnership (ACP) is dedicated to promoting collaborative study of our shared U.S., Bermuda and Caribbean environment through support of regional research and education programs. The Sargasso Sea is a vast patch of ocean in the middle of the North Atlantic that surrounds Bermuda and borders the United States and the Caribbean. Sargassum seaweed, for which this area is named, is home to an amazing variety of marine species. The Sargasso Sea is also a spawning site for threatened and endangered eels, as well as white marlin, porbeagle shark and dolphinfish. Humpback whales migrate through the Sargasso Sea each year. Commercial fish, such as tuna, and birds also travel through the Sargasso Sea and depend on it for food. Bacardi supported this effort by hosting an educational event attended by 250 guests, including leading scientists, environmental groups and Bacardi employees who have an interest in protecting the Sargasso Sea. Organizations including BAMZ, Bermuda Underwater Exploration Institute, Keep Bermuda Beautiful, Greenrock, Ocean Support Foundation, Bermuda Marine Debris Taskforce, Pew/Blue Halo and the Sargasso Sea Alliance participated to bring more awareness about the mission of the Bermuda Alliance for the Sargasso Seas. For CR Month, the Bacardi team in China, with help and guidance from volunteers of HeLin Art in Community gathered information at a designated area to create a species map and phone app to be used in community education. The HeLin Art in Community is a non-profit organization geared at renewing the relationship between people, nature and art. HeLin Art encourages sustainable communities through appreciation of nature’s art. The goal was to document 36 different plants. Bacardi volunteers were able to capture 39 different plant species and record them through photographs and written descriptions. During CR Month 2014, two teams from Bacardi in Germany volunteered in the surrounding area of Hamburg with the Union for the Environmental and Nature Conservation (BUND), an organization that protects the natural environment and wildlife. One team converted an abandoned building in the woods into a new home for bats and insects, including a species of protected hornets. Using some 400 kilos of loam and 10 meters of wooden beam, as well as stones and pan tiles, the team created a new home for a variety of animals. On one side of the old building, volunteers installed 13 nesting boxes for bats. The second team dedicated 150 hours of weeding and pruning fruit trees to preserve a meadow orchard – a traditional and protected cultural landscape with important ecological value. 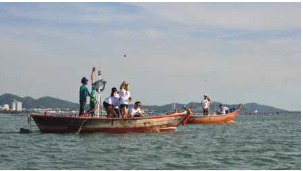 Bacardi in Thailand with the Federation of Community Organizations (Bang Pa Municipality) produced 1,600 microorganism mud balls to clean the ocean environment during CR Month. Bacardi helped keep the ocean clean to benefit the society in Thailand, as its main business is derived from tourism. The activity was focused on making Effective- Microorganism (EM) mud balls and tossing the balls into the ocean to clean the environment. The purpose is to help keep circulation of sewers and streams clean. The EM in the ocean helps to degrade pollutants flowing into that area of the sea. This year, Bacardi gave its second installment of a threeyear commitment to provide financial support (totaling US $150,000) for the Bermuda Heart Foundation’s operating expenses. The Bermuda Heart Foundation is the leader in heart healthy advocacy on the island. The goal is to reduce the number of heart-related deaths on the island by 25 percent within three years. The Women’s Resource Center (WRC) offers counseling service for issues related to women and their families. As part of the Sexual Assault Response Team (SART), the WRC offers a 24-hour helpline offering assistance with regard to sexual assault or any women’s-related issue. The WRC provides programs in schools regarding healthy relationships. It advocates to change laws pertaining to sexual assault and physical abuse. The organization also provides support to women during legal processes. With the motto Strong Women, Strong Families, Strong Community, the WRC provides assistance to survivors of sexual assault. The program addresses issues of declining self-esteem, unhealthy relationships and parenting concerns through educational programs, including personal-safety demonstrations. The aim is to empower women to make better life choices, shifting from response to prevention training. Bacardi supports the WRC through financial donations towards operational costs for the programs. This year, a total of US $10,000 was given to the WRC to support its crisis intervention program. Created in 1997, Les Toiles Echantées travels to hospitals all over France to bring the latest movies to children and adolescents who are sick or handicapped. The organization provides a large projection screen so children can view the latest films as a real cinema experience. In addition to providing a donation of US $10,000 for the operation of Les Toiles Echantées, Bacardi employees in France are given one workday each year to help set up movies in hospitals near where they live. This is a wonderful opportunity for our employees in France to benefit children in their neighborhood hospitals. 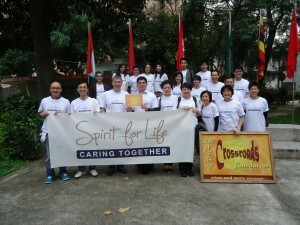 The Crossroads Foundation is a Hong Kong-based non-profit organization, aiming to bridge the gap between those in need and those who can provide. 21 employees from our Hong Kong office participated and were assigned to areas such as: incoming goods, technology, household, furniture, food handling and shipping. Volunteers helped in the distribution of donated goods. They checked, sorted, assembled/ disassembled various packaged donated goods (including blankets, computers, furniture, hospital beds) and subsequently prepared them for shipment. The Bacardi team also made an in-kind donation for transportation costs for bottled water, part of the donated goods for distribution to the poor. These efforts contributed to facilitating the distribution process of donated goods that ultimately benefit those in need both locally and globally. In June 2013, a flash flood wreaked havoc on the lives, homes and livelihood of 178 villages. The goal of HelpAge India is to provide immediate relief with food, medicine, blankets and tarpaulin. Bacardi in India, in association with HelpAge India (a national NGO) planned to distribute raw food packages to the Uttarakashi villages affected by the flash flood. 1200 packages of raw food packets were distributed to the 14 villages in the district. The HR director, Senior Manager, and the Corporate Responsibility manager of Bacardi in India visited the Uttarakashi District and spent two days with representatives of HelpAge India to supervise the distribution and meet the Village heads. Proyecto Sin Paredes is a Summer Camp for disabled adults that takes place during the last weekend of May. Bacardi supports this summer camp program with a donation each year, as well as through employees participating on a volunteer basis for the camp. As part of CR Month, the Puerto Rico team participated as volunteers assigned to serve as their arms and legs during the weekend. This year more than 150 adults participated in the camp, with a total of 200 volunteers assisting. The Emma Children’s Hospital is one of the largest pediatric hospitals in the Netherlands, caring for children with chronic diseases and long-term health problems, (from birth to age 18). In addition to providing medical care for children, the hospital is a research center and home to pediatric medical training programs, and supervision for medical students. Bacardi donated US $17,600 worth of product to help the goals of the hospital’s fundraising event in fiscal 2014. The fundraiser allowed people to purchase tables for 7500 Euros with bottle service. The evening fundraiser brought in US $400,000 for the benefit of the Emma Children’s Hospital. City Harvest is the world’s first food rescue organization, dedicated to feeding the city’s hungry men, women and children. City Harvest collects almost 28 million pounds of excess food from all segments of the food industry, including restaurants, grocers, corporate cafeterias, manufactures and farms. The food is then delivered free of charge to nearly 600 community food programs throughout New York City, using a fleet of trucks and bikes, as well as volunteers on foot. Each week, City Harvest helps over 300,000 hungry New Yorkers to find their next meal. In fiscal 2014, BOMBAY SAPPHIRE donated over US $90,000 through point-ofsale and product donations for City Harvest’s annual LuckyRice festival fundraiser. City Harvest pairs with LuckyRice to fundraise for the food programs. The LuckyRice festival brought a variety of Asian cocktails and cuisine to NYC from April 29-May 5, 2013, before going to Los Angeles, Las Vegas, Miami and San Francisco. Featured chefs at the event included Masaharu Morimoto, Danny Bowien, Marcus Samuelsson and Susur Lee. BOMBAY SAPPHIRE was a presence at the New York City, Las Vegas, and Miami festivals, contributing over US $65,000 to the NYC event, a US $8,048 product donation to the Las Vegas event, a US $10,643 product donation to the San Francisco event – and an additional US $9,696 to the Miami event. In Miami, the event took place at the Raleigh Pool and Oasis to create an international bazaar, featuring Asianmeets- Latino bites and globally spirited cocktails crafted from Miami’s top chefs and mixologists. Eight local mixologists created an original BOMBAY SAPPHIRE EAST cocktail and others, featuring a Bacardi Portfolio spirit. The Consequence Foundation helps provide educational resources and experiences for kids in need, including, but not limited to scholarships, vocational training, camps, workshops and after-school activities. The Foundation encompasses a dynamic curriculum of culture, arts, life skills, career aptitude, and discovery and workforce preparation. Every year South Florida’s top philanthropists, business leaders and legal minds gather for worldclass entertainment, five-star dining, live and silent auctions and more to raise funds for children in need. Bacardi donated US $17,000 worth of product for this spectacular event. The gala benefited Teach for America, Breakthrough Miami and Big Dreams for Kids among others. It was held at the historic Fointanbleau Hotel in Miami Beach, in the main iconic Sparkle Ballroom, and featured entertainment by superstar Flo Rida. GREY GOOSE is a proud supporter of the Elton John Aids Foundation and is heavily involved with the charity throughout the country. The Foundation was established in the United States in 1992 by Sir Elton John, and is headquartered in New York City. In 1993, the Foundation became a registered charity in the United Kingdom, headquartered in London. These two organizations aim to reduce the incidence of HIV/AIDS through innovative HIV-prevention programs, efforts to eliminate stigma and discrimination associated with HIV/AIDS, and direct treatment, care and support services for people living with HIV/Aids. The Foundation supports this mission through proceeds from special events, cause-related marketing projects, and voluntary contributions from individuals, corporations and foundations. On Tuesday, October 15, 2013, Sir Elton John continued his humanitarian efforts to raise money for HIV/AIDS prevention, treatment, and awareness programs across the United States, the Americas, and the Caribbean at the foundation’s 12th annual benefit “An Enduring Vision”, held at Cipriani Wall Street. GREY GOOSE donated over US $9,900 worth of product for this special event that raised over US $3,500,000 for the foundation.